Were you aware that humidity can actually hurt your air conditioner? Consider this—humidity is excess moisture that comes with the high summer temperatures we deal with here in the Gainesville area and beyond. The moisture makes us uncomfortable and feel even hotter since we can’t sweat, so we turn our air conditioner’s thermostat as low as it will go to try to cool off faster. This makes your air conditioner work harder (harder than it should have to, by the way) and therefore increases wear and tear on the system. In addition, you’ll have done nothing to actually rid your home of that excess humidity, leaving you still uncomfortable, prone to property damage, and prone to illness brought on by the development of mold and mildew. How High Is “Too High” for Humidity? Humidity levels are too high when they go above 50%. On the other hand, if your home’s relative humidity level is below 30% it means the air is too dry. This is a rare occurrence in Florida, but worth noting nonetheless. A relative humidity level above 50% is usually when most households notice discomfort. After all, we stay cool by sweating and having that sweat evaporate off our skin. Excessive humidity doesn’t allow for this. When humidity levels are too high, it means there is too much ambient moisture in the air to allow our bodies to cool off. Therefore, we stay heated, leaving us feeling sticky and gross in the muggy air. Plus, as we mentioned above, it encourages the growth of mold and mildew which can make you sick (especially if you already suffer from allergies or asthma). So if the best way to lower humidity is to lower the temperature of the room, isn’t turning the thermostat down the right idea? We understand why you’d think this, and yes, your air conditioner does have some dehumidification properties. But, your cooling system’s primary job is not to dehumidify your home. They aren’t designed for this purpose, after all. Sure, they remove some moisture from the air naturally by design, but it is not a significant enough amount to make a difference, and you don’t have control over how much or how little moisture is actually being removed. Overall, excess moisture in the air causes your AC system to work harder than it should have to, just to do its job of conditioning the air. 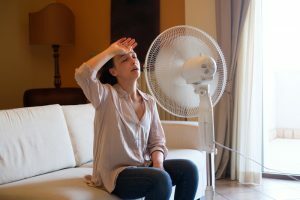 Since the air feels hotter when humidity levels are too high, you could find yourself setting the thermostat lower, while your energy bills go higher. The only way for us to determine this is to inspect your air conditioner. Humidity itself cannot directly hurt your air conditioner, but as we outlined above, it contributes to how hard the cooling system works. And since we live in Florida, your air conditioner works hard as it is! Calling for an inspection is a great idea, as is ensuring that you have annual maintenance sessions on your schedule. During maintenance, our technicians fully inspect, adjust, and clean the interior of your air conditioner to make sure it’s operating as effectively and efficiently as possible. The best thing you can do for your Florida home to help it get through our summer days is to have a whole-house dehumidifier installed. These systems are designed to remove the excess moisture from your home’s air and are installed directly into your ductwork, out of sight.